King George V reigned from 1910 to 1936. The onset of the first World War ( 1914-1918 ) was a difficult time for him because he represented England, which stood on the Allies’ side of the war, while many of his relatives were German and on the opposing side. Because of this great conflict, he chose to give up all of his German titles on behalf of his people and changed many of his relatives’ German-sounding names to English-sounding ones. One such name might be familiar to you. 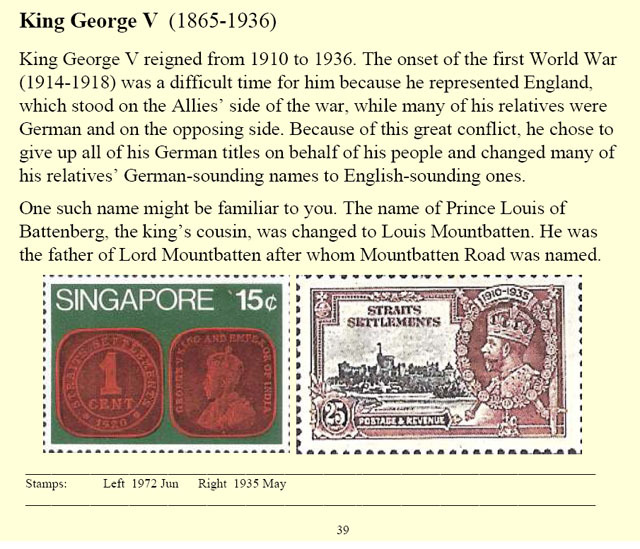 The name of Prince Louis of Battenberg, the king’s cousin, was changed to Louis Mountbatten. He was the father of Lord Mountbatten after whom Mountbatten Road was named.